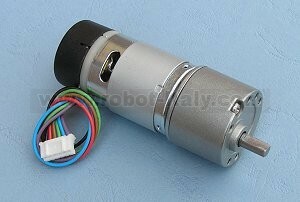 The EGM30 (encoder, motor, gearbox 30:1) is a 12v motor fully equipped with encoders and a 30:1 reduction gearbox. It is ideal for small or medium robotic applications, providing cost effective drive and feedback for the user. 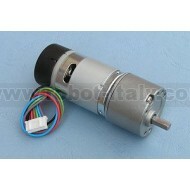 It also includes a standard noise suppression capacitor across the motor windings. The EGM30 is supplied with a 6 way JST connector (part no PHR-6) at the end of approx 90mm of cable as standard. note that pull up resistors (we used 4k7) are required on the hall sensor outputs, and wires are the colours from the actual cable. The MD25 is a robust I2C dual motor driver, designed for use with our EMG30 motors.